"This Assembly has affirmed the vitality of the ecumenical movement and the commitment of the churches to the ecumenical vision and goal of unity, and to strive for a more just and peaceful world," said WCC general secretary Rev. Dr Samuel Kobia following the closure of the event. 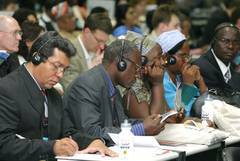 Addressing the core issues of Christian unity, the Assembly agreed on a new text, "Called to be the One Church," and urged that WCC and its member churches give priority to the questions of unity, catholicity, baptism and prayer. 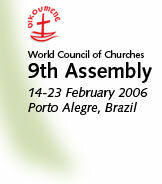 Recognising a rapidly-evolving church and social context, and faced with a decline in income, the delegates agreed to focus future WCC work on a limited number of core issues and urged the WCC to "claim a clearer and stronger public profile in its witness to the world". "The WCC should do less, do it well, in an integrated, collaborative and interactive approach," said the Rev. Dr Walter Altmann (Evangelical Lutheran Church of Brazil), moderator of the programme guidelines committee which formulated the proposals. Calling for a strengthened theological basis for all areas of activity, the delegates also pointed to the need for comprehensive planning and communication strategies "to build engagement and ownership by the churches". The Assembly affirmed that WCC should expand its work on alternatives to economic globalization, deepening the theological and analytical grounding of this work, and sharing "practical, positive approaches from the churches". The mid-term of WCC's Decade to Overcome Violence (DOV) was celebrated at the Assembly - which received messages from three Nobel Peace Prize-winners - and the delegates recommended that the WCC move towards an international Ecumenical Peace Convocation. A candlelight vigil for peace was held in central Porto Alegre to launch the Latin American annual focus for the DOV.